With two outstanding veterinary hospitals, highly distinguished research facilities, and an academic program that’s consistently ranked in the nation’s top ten, the University of Pennsylvania’s School of Veterinary Medicine not only keeps our pets and farm animals safe, its research plays a critical part in global health and food safety. The University of Pennsylvania School of Veterinary Medicine is a large, complex, and world-class institution, but unfortunately, its website was only large and complex. With multiple business goals and no one providing oversight to their digital presence, its website soon became outdated and unruly with confusing navigation, duplicated content, and broken links. 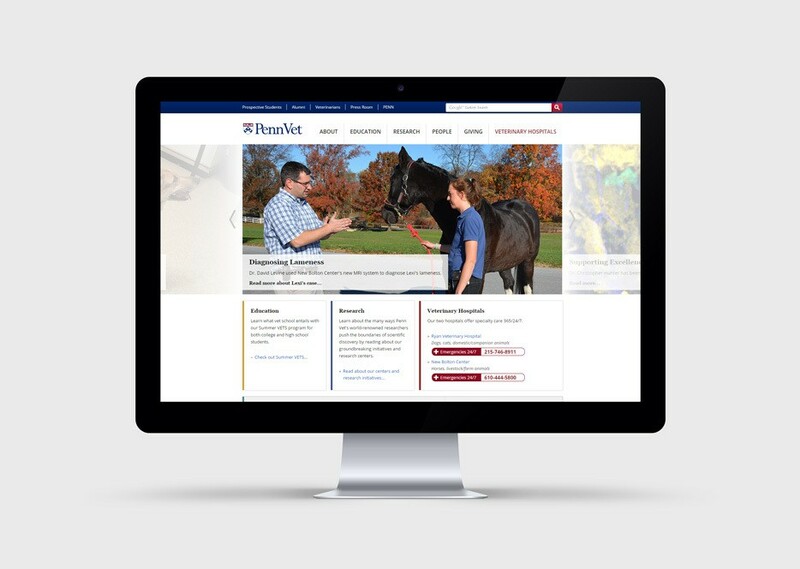 After Penn Vet made the decision to overhaul the entire site, a very comprehensive research phase followed: we audited 550 pages of existing web content, conducted 27 stakeholder interviews with groups throughout the institution, and led three separate focus groups with clients and veterinarians outside of Penn Vet. Stakeholders also participated in information architecture exercises like a modified Delphi card sort that verified our initial content organization and a “divide the dollar” exercise that helped prioritize all the website features. With our research summarized, we were able to distill everything we learned into sitemaps and wireframes that defined the structure and content of the new site. Keeping the site’s three main audiences in mind, we tailored the new web experience for animal owners, prospective students, and the scientific community. 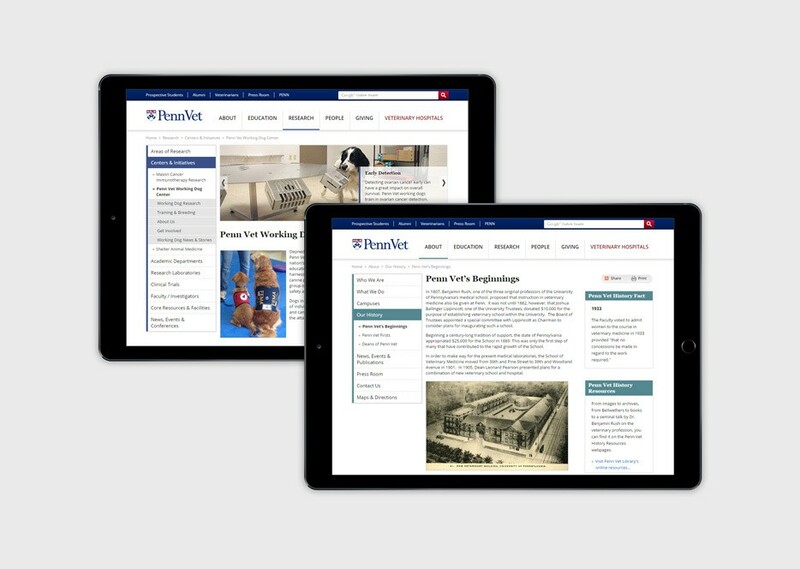 With a new website built upon a flexible content management system, Penn Vet admins can easily create custom workflows and edit page content and templates. News, events, staff information and even emergency information are all readily editable within the system. The result is a sophisticated and forward-thinking website that finally matches the world-class reputation of Penn Vet.